Pat LaMarche, Green Party leader, protests in front of the Bangor Police Department in response to a Facebook post the department made last week about warning residents against donating money to panhandlers. 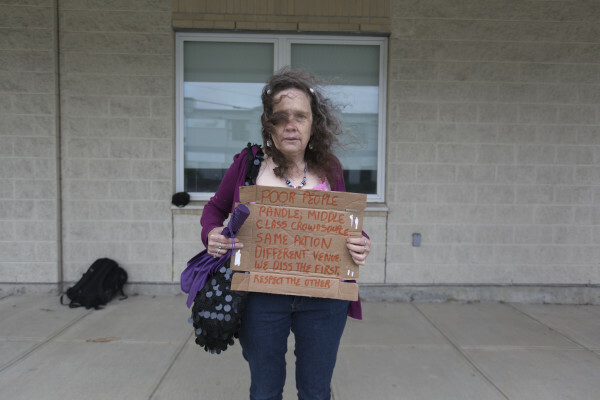 Julia Hatheway protests in front of the Bangor Police Department in response to a Facebook post the department made last week about warning residents against donating money to panhandlers. 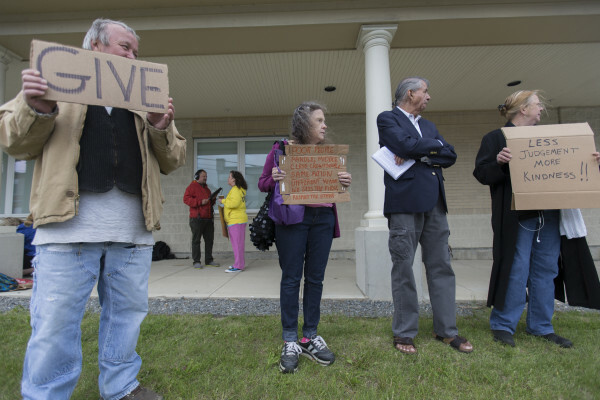 Protesters defend the homeless in front of the Bangor Police Department on Monday, June 8. People protest in front of the Bangor Police Department in response to a Facebook post the department made last week about warning residents against donating money to panhandlers. 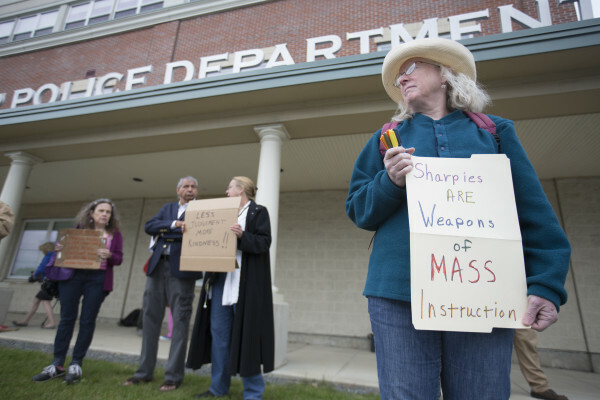 Protesters defend the homeless in front of the Bangor Police Department on Monday June 8. 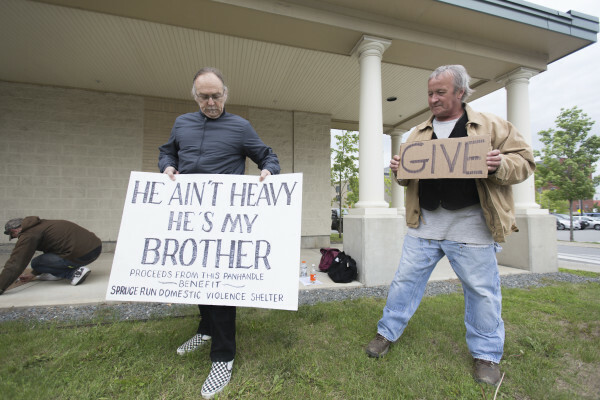 BANGOR, Maine — A dozen people joined Green Party leader Pat LaMarche on the sidewalk in front of the police station Monday to protest a Bangor Police Department Facebook post last week that asked residents to avoid giving money to people panhandling. “When you beg for money and beg for food, that doesn’t make you a bad person,” Allen Sockabasin, a member of the Passamaquoddy Tribe and local voice for native Americans, said while standing with the protesters. He said he “absolutely” gives to panhandlers. “I do my part. I do my share,” Sockabasin said. Bangor police spokesman Sgt. Tim Cotton issued a statement responding to LaMarche’s request Monday afternoon. “Our post was intended to warn visitors and citizens of the City of Bangor about aggressive panhandling and the benefits of giving to a local, verifiable charity. If one peruses the stories that were shared by followers of the page, they would see that it is a nationwide issue and is not endemic to Bangor. We appreciate the support that we have received for warning the public about the issue,” Cotton said in an email. The department’s Facebook post is a warning to people about panhandling scammers — those who live off people’s charity by lying — and is written in an informal style. Cotton said Sunday that the June 4 Facebook post is a warning about aggressive panhandlers who have frightened some people with their tactics. Bangor’s post goes on to say that not all the people who ask for money from strangers are scamming people, and it adds that those who want to help the needy should give to local charitable organizations. People who fall through the cracks panhandle, she said. LaMarche later reported raising $50 via the protest to be donated to Spruce Run, for women affected by abusive partners.